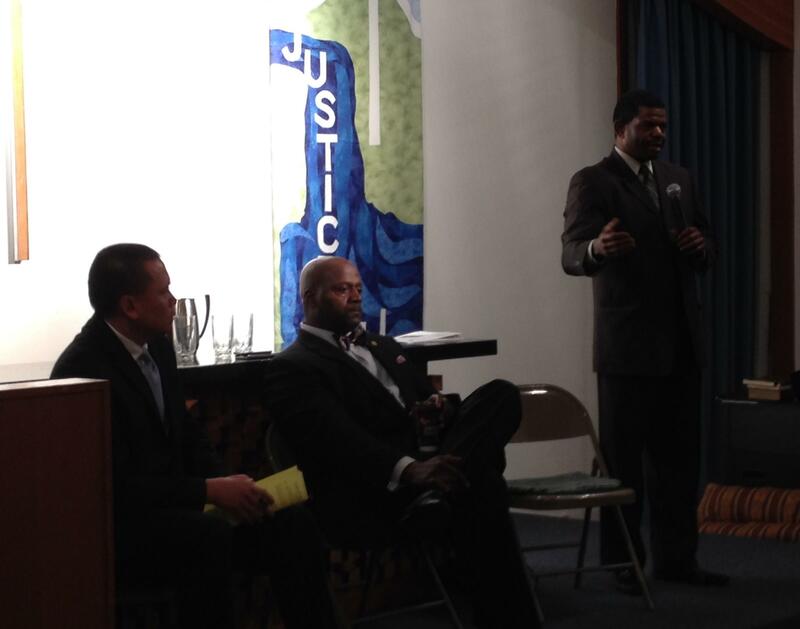 Ann Arbor Police Chief John Seto, Washtenaw County Sheriff Jerry Clayton and Michigan ACLU Field Director Rodd Monts. On the subject of community policing, Chief Seto said it's difficult to do it right without enough police officers. And he said an important element of community policing is having officers in area schools. "If I had more officers, that's one of the first places I'd go to is getting back into the schools, as well as into these neighborhoods," Seto said. "So that's what we're trying to do. We're trying to continue to grow that." That's an area in which some in the audience disagreed with Seto, expressing concerns that putting cops in schools just means more young minority students behind bars. LeRon Williams of Ann Arbor attended the forum. He said he's very much worried that what happened in Ferguson could happen here, and could happen to him. But he was glad to hear Chief Seto and Sheriff Clayton say earning the community's trust is an ongoing process, and that they've bought into it. "One of my greatest fears about what happened in Ferguson is that it'll be looked at as an isolated event," Williams said, "and we'll be right back here again in six months." The meeting was sponsored by the Interfaith Council for Peace and Justice and Veterans for Peace Chapter 93.